"One under many, many under one"
Pavonistade (/pərvəniːsteɪd/; Pavon: Pavonisteid [pərviːəʊnˈsteɪd]), officially the Pavonistadian Provinces (Pavon: Perovenses Pavonisteidch) and also known as the Province, is a sovereign state containing eight first-level administrative divisions. It is located in southern Nordania, a continent in Esquarium. Pavonistade is bordered by Karazawa to the west. Numerous indigenous tribes inhabited what is now called Pavonistade, before they formed civilizations known as combines. Various combines ruled over the Pavonistadian mainland and archipelago, with the two enduring nations being the Jopj Combine and the Xatoura Combine. The two Pavonistadian powers had contact with foreign powers and were swayed with foreign influence for several centuries. Before Pavonistade was formed in the 19th century, the Jopj Combine annexed the Xatoura Combine. A Directorate government governed Pavonistade for decades, before it was abolished in 1906. Since then, it has been involved in notable conflicts and events, such as the War of the Confederation. Pavonistade is a federation ruled under a presidential democracy and is led by the President. Pavon is the sole official and national language of Pavonistade, but multiple languages are recognized at provincial or local levels. The country is populated by over 52 million people as of the 2013 Census held by the government. An advanced economy and large trade networks allow Pavonistade to evolve into a notable power. Pavonistade is a developed first-world nation and is considered to be a middle power. Pavonistadians tend to enjoy an opulent life owing to high standards of living in the country. Pavonistade is a member of multiple international organizations and maintains bilateral relations with most other nation-states. The name Pavonistade supposedly originates from the Jopj word pafafa, which means "village" or "city" for the natives. While the Jopj Combine employed Proto-Pavon, the precursor to the Pavon language and lingua franca between mainland Pavonistadian indigenous groups, the word pavon replaced pafafa. This change was likely enforced within a few centuries after the founding of the Jopj Combine in 971 BCE. Proto-Pavon also made use of istatii, which means "of the people" and is often used in combination of other words. After the Jopj-Xatoura War from 1748-1750, the Jopj Combine annexed the Xatoura Combine. The Chief Raur Ja'anierm then began substantial restructuring of the Jopj Combine. Changing the name of the Jopj Combine was one of the many decisions involved in the multi-step political and cultural reforms. Later the decision was made to replace the nation's name with Pavonistatii, bearing the meaning "village of the people", which was soon accepted as an alternative and seemingly-modern name for the Jopj Combine. Some time during 1751, the name underwent a slight change and was modified into the present-day Pavonistade. Human existence in Pavonistade had been dated back to 20,000 BCE, with the oldest human remains located near the settlement of Kaspor in what is now known as Western Pavonistade. Analysis of such remains indicated that humans either lived in natural structures such as caves or in artificially-constructed structures, making use of natural resources such as wood. Early humans lived a hunter-gatherer lifestyle, and usually their food by hunting or fishing. Traces of human existence suggested that cannibalism and other ancient rituals were practiced in previous millennia. The eruption of Mount Ulieses in around 10000 BCE marked the approximate end of the last glacial period but also delayed the creation of any Pavonistadian civilizations. Eventually, agriculture became commonplace in both the Pavonistadian mainland and archipelago. Large indigenous nations known as combines were also founded, as indigenous tribes with common interests began to unify. No combines have successfully unified all of the indigenous until 971 BCE, when commander Ebom of the Hals'se Combine conquered all major rivalling combines. After the Pavonistadian indigenous were unified, the leader Os'sieamnah established the Jopj Combine. He guaranteed semi-autonomy and religious freedoms for conquered regions in return for loyalty, which proved to be very effective. In the Pavonistadian archipelago, the Xatoura Combine conquered other independent island combines and unified the archipelago by 100 CE. Through centuries, the Jopj and Xatourans progressed socially, culturally, economically and technologically. The Directorate of Pavonistade was established on December 10, 1827 and oversaw the attempted assimilation of indigenous people into Pavonistadian culture. After decades of controversies, corruption and authoritarian rule, the Directorate began years of reforms that culminated with the introduction of democracy. On January 1, 1906, the Directorate was abolished and replaced with the Pavonistadian Provinces, under the government of Fred Matteryork. The primary and secondary sector mostly dominated the Pavonistadian economy, which suffered from a depression after an unusual sharp economic decline. Its effects inspired the inception of significant industrialization in Pavonistade, as well as a transition from an agrarian to industrial economy. In the 1960's, a wave of counter-cultural ideas swept through much of Pavonistade. Pavonistade consists of two regions, the Pavonistadian mainland and the Pavonistadian archipelago. 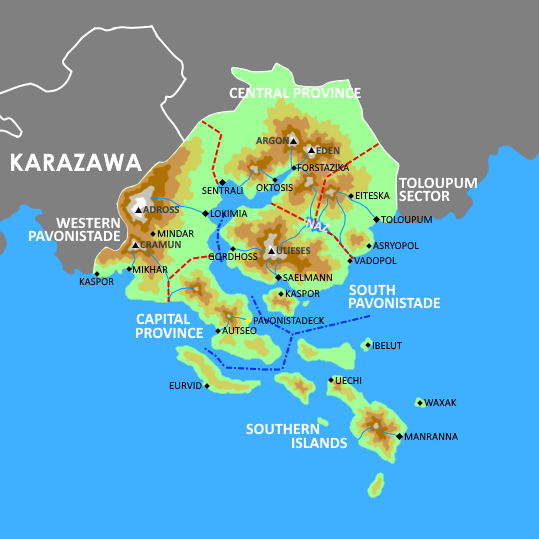 The term "Pavonistadian region" refers to both the mainland and the archipelago. Both the mainland and archipelago have mountainous landscapes that are shaped by volcanic activities over centuries or millennia. Pavonistade's volcanic and geothermal activity is a result of the Pavonistadian Belt, a collection of hotspots under the Pavonistadian. There are currently 49 active volcanoes in Pavonistade. In addition to this, there are several dormant and extinct volcanoes, with one of the most famous being the dormant volcano Mount Ulieses (2721 m). On the Pavonistadian mainland, there are three major mountain ranges. The Western Pavonistadian range contains Mount Adross and Mount Cramun, and borders the eastern mountain ranges of Karazawa. The Tousk range contains Mount Argon and Mount Eden, and acts as the northernmost source of the Tousk Inlet. The Ulieses range contains Mount Ulieses and is situated in the province of South Pavonistade. Smaller mountain ranges exist in Capital Province (Capital range) and the Pavonistadian archipelago. The body of water to the south of mainland Pavonistade is called the Pavonistadian Sea. The longest river is the Smasgtani River, with a distance of 805 km and defining parts of the border between Western Pavonistade and Capital Province. The largest lake is the Naz Lake, situated between Central Province, South Pavonistade and Toloupum Sector, with a total area of 970 km2. Many rivers in Pavonistade originate from the elongated mountain ranges of Central Province, Western Pavonistade and South Pavonistade. The Pavonistadian mainland hosts the Tousk Inlet, which extends hundreds of kilometers inland from the Pavonistadian sea. The Tousk Inlet separates Western Pavonistade and Capital Province from South Pavonistade and Toloupum Sector. The inlet also provides a passage from the interior of the Pavonistadian mainland to the Pavonistadian sea, allowing for effective maritime transport and trade. In addition, the inlet provides an environment for various unique aquatic life. As much of Pavonistade is mountainous or occupied by tropical rainforests, around 6.0% of land is considered arable. Much of Pavonistade is considered to have a tropical rainforest climate. Frequent precipitation of over 60 mm is expected each month and elevated temperatures between 22°C and 30°C are regularly experienced in low-altitude regions. The combination of climatic conditions allowed distinctive rainforests to develop on the Pavonistadian region, as well as a significant level of biodiversity to be established within such rainforests. In high or intermediate-altitude regions such as the Pavonistadian interiors, substantially-lower average temperatures and humidity are documented. Human activity and global warming has resulted in damage to sensitive environments, increased risks to endangered species and desertification. Pavonistade has six first-level administrative divisions, which are entitled provinces. Pavonistade is officially a federal constitutional presidential republic. Pavonistade has a Constitution, entitled the Constitution of the Pavonistadian Provinces, which is the supreme legislation of the country. Pavonistade maintains a presidential system. Executive position is held and led by a President, who has the ability to exert powers such as signing a bill (proposal, as called in Pavonistade) into law. Pavonistade is governed by a federal government Pavonistadian Government, which is divided into the Legislative Branch, Executive Branch, and Judicial Branch. The Parliament of Pavonistade is the main component of the federal legislative branch. It is unicameral and consists of a total of 261 seats. Each seat corresponds to an electoral district, also known as a constituency or riding, which represents approximately 200,000 residents. There are six political parties represented in the Parliament, but two do not have official party status. Such status is granted to any parties that have received either 10% of constituencies or 10% of the popular vote. Official party status grants certain parliamentary privileges to parties and party members, such as the right to participate in Question Period. Besides drafting and passing laws, the Parliament is capable of commencing, debate, and pass or defeat a vote of no-confidence if most Members of Parliament declared that the President is no longer deemed fit to hold executive position. Members of Parliament have no limits on the amount of times they may seek re-election for their constituency. A tabled bill in Parliament undergoes a series of readings to determine legality and any need for amendments. In voting sessions, MPs may approve, reject, or abstain from voting and any bill must be passed with a supermajority (excluding abstentions). A passed bill is transferred to the Presidential Cabinet where the bill may be promulgated, vetoed, or disregarded for up to five days. The electoral system used in Pavonistade is first-past-the-post and constituencies, divided based on population, correspond to provincial borders. General elections occur every four years. The President is the head of state and government of Pavonistade. The term cabinet may refer to the main composition of the Pavonistadian Government (President, Vice President, and ministers). The official residence and workplace of the President is the Presidential Palace. Under a presidential system, the President is the highest position and the most powerful person in Pavonistade. The President is obliged and tasked to exert executive power and contribute to managing the nation as a whole. However, the power of the President and the Executive Branch is limited. The President has various powers, including but not limited to promulgating, vetoing, or ignoring a bill; tabling a bill; and issuing a pre-emptive signature or executive order under certain circumstances. A presidential veto may be overridden by a supermajority in the Parliament (two-thirds of MPs). The powers of the executive branch are limited by the Constitution. The President would continue to serve until they resign, are impeached, a vote of no-confidence against their government passes, or they die. A President may serve for up to three consecutive terms, each term with a length of 4 years, although otherwise they may seek re-election without limitation. The Supreme Court of Pavonistade is the highest court in Pavonistade and the main component of the judicial branch of the federal government. Nine Justices, including one Chief Justice, serve in the Supreme Court and have life tenure and may hold their positions until they are mandated to retire at age 75. On occasion the judiciary may interpret the Constitution and federal laws, oversee balance among the three government branches, resolve legal action involving the federal government and hear certain appeals from inferior courts. Pavonistade has a bijuridical system, employing elements from both common law and civil law. Pavonistade maintains a semi-interventionist foreign policy. The foreign affairs and relations of Pavonistade is the responsibility of the Ministry of Foreign Affairs. Construction of several Forstazikan skyscrapers. Globalization had marked a strong expansion in the Pavonistadian economy. The modern Pavonistadian economy is marked by a strong employed force, a stable currency, enlarging tertiary and quaternary sectors, shrinking primary and secondary sectors, and strong trading networks. The Pavonistadian economy, currency, and employed force had blossomed in recent times. Prior to the Pavonistadian Industrial Revolution, Pavonistade's economy was based heavily on the primary sector. The agricultural, fishing, and lumbering sectors accounted for an overwhelming majority of occupations in Pavonistade. Even in the present day, the primary sector plays an important role in Pavonistade's economy, though it has been mostly overtaken by the secondary, tertiary, and quaternary sectors. The Pavonistadian Industrial Revolution took place during the 20th century and shifted Pavonistade' economic focus from the primary sector to other sectors. Manufacturing and production in Pavonistade enjoyed a few decades of success and prosperity, before the economy became more reliant on service- or information-related sectors. As of April 2017, both the nominal GDP and PPP-based GDP lie above $2.1 trillion and the unemployment rate is at 5.5%. The currency of Pavonistade is the Pavonistadian Pavoid, represented by the symbol ♇. The most commonly-imported goods include vegetables, fruits, water, aluminum, steel, uranium, and fossil fuels. The most commonly exported goods include electronics, machinery, automobiles, aircraft parts, plastics and non-fuel oil products, chemicals, and pharmaceutical products. Countries such as Luziyca are considered to be important trading partners with Pavonistade. Pavonistade serves as one of the many important hubs for maritime trade. Its multiple harbors and position help to connect multiple nations and create a notable trading network. Water systems, such as the Tousk Inlet, are used by Pavonistadian and foreign ships for trading, transporting, and travelling. Air-based trade is also significant in Pavonistade. Within Pavonistade, rail systems and extensive cargo trains are often used to transport goods and products from one Pavonistadian location to another. The Pavonistadian Armed Forces has enlisted 521,210 personnel, or around 1% of Pavonistade's population, as of January 2017. Among the amount in the military are 348,330 personnel in reserves and 53,000 in active service, with an additional 119,880 paramilitary personnel. The Pavonistadian Military is split into three divisions, namely the Pavonistadian Army, the Pavonistadian Aerospace Force, and the Pavonistadian Navy. The President serves as the Commander-in-Chief. A selective service system exists in Pavonistade, identifying individuals that could potentially be drafted when the need arises. As a first-world nation, Pavonistade has the ability to develop and maintain a strong infrastructure. A healthy amount of funding and industrious maintenance groups for infrastructure allows it to sustain its remarkable strength, efficiency, and benefits. The infrastructure helps to not only transport people from one Pavonistadian location to another, education and health care are much improved and are some major fads of Pavonistade. A high-speed rail passenger train in a Pavonistadeckian station. An average Pavonistadian road system consists of well-maintained asphalt roads and usually connects two settlements together, particularly cities and large towns. The TransPavonistadian Highway is the largest road system in Pavonistade, connecting all major cities (excluding Manranna) and several minor cities. Major roads or sections may be frequently congested with automobiles, such as the Pavonistadeckian-Vadopolitan section of the TransPavonistadian Highway. Roads may be seen with road maintenance and construction workers repairing any major road issues, but road maintenance is becoming a less frequent sight as its infrastructure is well-funded, built with care, inspected appropriately, and bettered. Most maintenance is government-funded although the private sector has a role in funding. Public buses are the cheapest form of public transportation and can be conveniently used to travel across a city or town, although it is not as cheap as travelling with a car, bicycle, or personal transportation. Public bus routes do not include areas beyond the vicinity of large settlements, hence rural areas being bereft of public buses. Other forms of buses would be required in order to reach non-urban or non-suburban areas. Bus systems are the responsibility of municipal governments and often have government oversight. Rail networks in Pavonistade consist of underground rapid transit, overground light rail, and high-speed rail. The Pavonistadian National Railway is the largest rail network, having intercity rails that include all cities through both overground and underground tunnels, excluding Manranna and cities that do not lie on mainland Pavonistade. Usually, Pavonistadian passenger trains reach a maximum of 220 mph while commercial trains reach a maximum of 185 mph. Census data approximates that one-quarter of Pavonistadians travel on rail and most of inter-Pavonistadian transportation is done by this method. Taxation is an important factor in funding Pavonistadian education. Reforms in 2010 allow the Pavonistadian Government to offer universal primary education as well as universal childcare. One would be educated first in preschool starting from the age of 3 and ending at the age of 5. Preschool terms last 2 years. One would then advance to primary school for 7 years, from age 5 to age 12. Following primary school would be secondary school, which lasts for 5 years and from age 13 to 17. Tertiary school (i.e. college, university), which is split into undergraduate and postgraduate, would last for 4 to 9 years, depending on the degree one wishes to pursue or the subject one wishes to study. The literacy rates of both children and adults rest at 98%. 90% of adults (aged 18 and above) hold a secondary school diploma or equivalent. 63% of those who had a secondary diploma had enrolled in tertiary education and acquired a college or university diploma. 46% of students enroll in public schools, while 18% attend private schools, 11% are home-schooled, 9% attend alternative schools, 7% attend religious schools, and 2% are cyber-schooled. Pavonistade has a national single-payer health care system as of 2010. Although single-payer health care already existed in Capital Provinces and Western Pavonistade before 2010, the concept of a medical scheme that covers all of Pavonistade is still new. The large-scale reforms in the health care system lead to many consequences to be addressed such as mounting expenditures, proper care for all patients, and appropriate coverage of expenses. One has the ability to opt for private health care or private medical insurance instead, though both are regulated by the federal government. Pavonistadian health care is well-known for its competence. Government and third-party analysis indicates that incorrect medical procedures in Pavonistade are exceptionally rare, and treatment is usually successful for many illnesses. The overall infrastructure allows for continuous management of aliments, end-of-life care, and long-term or severe illnesses including HIV and Toloupum fever, despite noted flaws. There are 10 deaths per 1000 people as of 2012. A variety of viral hemorrhagic fevers and notorious diseases are prevalent in Pavonistade since ancient times and still affect at least a dozen people every year. This may have pushed development into Pavonistade's health care system in the 20th and 21st centuries to appropriately respond to cases of such illnesses. A geothermal power plant in South Pavonistade. Most of the energy produced Pavonistade is derived from nuclear fission or renewable sources. Campaigns have been launched by both the federal government and non-governmental organizations to completely shift away from non-renewable energy source and towards renewable energy. Pavonistade is situated above several hotspots, providing a potentially large-scale source of geothermal energy. The abundance of rivers in Pavonistade has also led to various hydroelectric projects. Mountainous terrain is seeing an increase in wind farms and solar parks, likely due to the attempted exploitation of increased wind speeds and sunlight in promising regions. Nuclear power plants are the most common power plants in Pavonistade, and account for 40% of all energy in Pavonistade. Virtually all reactors in Pavonistade are Pavonistadian Deuterium Uranium (PADU) reactors. Fossil fuel power plants, primarily coal-fired plants, account for 14% of all Pavonistadian energy and electricity. The remainder of energy demands in Pavonistade is satisfied by hydroelectricity (16%), geothermal energy (15%), wind energy (6%), garbage incineration (5%) and other forms of energy (4%). Pavonistade has markedly invested in research and development as well as scientific innovations, particularly during the 20th and 21st centuries. The Pavonistadian Government has supported various efforts in many different areas, such as improved energy efficiency in civilian products and augmented defense systems for the military. Extensive laboratories and STEM courses have been established by multiple provincial governments in an effort to promote science among Pavonistadians. Most research and development are funded by the Pavonistadian Government. However, private organizations have also carried their own processes, with one of the largest private R&D organizations in Pavonistade being Torrent Initiative. In the contemporary era, there has been extensive collaboration between the Pavonistadian government and private organizations. Both also aim to collaborate with foreign countries, especially neighbouring countries. Most well-known projects in Pavonistade are related to emerging technologies such as precision agriculture. Scientific programs in Pavonistade include a civilian space program and a national nuclear program not intended for nuclear proliferation. The federal government ministry responsible for tracking various demographic data and changes in Pavonistade is the Ministry of Social Development. The 2013 Census indicated that the population in Pavonistade was 52,120,596 as of that year. The ten-year population growth rate is around 7% and the fertility rate is 2.05. The Pavonistadian population consists of various ethno-racial groups, the largest being White Pavonistadians which constitute around half of the national population. A substantial increase in population growth in the last century was coupled with increased immigration and reduced death rates. Pavonistade is currently approaching Stage Four of demographic transition. 65% of Pavonistadians live in urban areas whereas 35% live in non-urban areas. South Pavonistade is the most-populated province in Pavonistade and hosts the most populous metropolitan area in the country. In contrast, the least populated province is Western Pavonistade, which contains one of the highest rural populations in the country. Census data of populations in municipalities are usually based on combined statistical areas. Pavon is the official language of Pavonistade, as well as the first language of most Pavonistadians. It is a constructed language based on numerous indigenous languages. In addition to the two official languages, at least two more languages have provincial significance; German is recognized by multiple provinces, while Azawarecha is a recognized language in Western Pavonistade. French is often used as a lingua franca between many groups in Pavonistade. More than half of Pavonistadians are atheist, agnostic, or irreligious. According to the 2013 Census and several Ministry of Social Development reports, 62% of all Pavonistadians identify themselves with no religion, 30% with Saturnalia, 7% with ancient Pavonistadian indigenous religions (Pavonic religions), and 1% with other religions or cults. During and after the 19th century, Pavonistade became increasingly secularized as its governments - both the Directorate and its successor democratic government - distanced themselves from religion. By the 20th century, separation of religions from the state was mandated by the Constitution of Pavonistade. The long-lasting distance between the Pavonistadian government and religions allowed the existence of a mostly-irreligious population. Saturnalia is the most prominent religion among religious Pavonistadians, after it had spread into Pavonistade from nearby countries. The next most prominent religion is Hals'se religion, first worshiped by the nation that subsequently founded the Jopj Combine. The Hals'se religion had ancient roots and held great influence in the Jopj government, but is now reduced to a minority religion. The Xatoura religion, first worshiped by ancient inhabitants of the present-day city of Manranna, began to bear prominent influence on the Jopj Combine during the 18th century. In contrast with the Hals'se religion, the Xatoura religion is heavily based on shamanism, spiritualism, and Medicine people. Cults and new religious movements have not found favour among the Pavonistadian populace, but the Constitution of Pavonistade guarantees extensive freedom of religion. The most recognizable example of cults or emerging religions is Pavonistadianism, which regards Pavonistade as heaven and its president as God of the Universe. Though Pavonistadianism has very few followers (numbering around 1000), its followers aggressively promote their beliefs and their stances on social issues (e.g. LGBT rights) are rather liberal. Pavonistadian families are generally kept small in an effort to promote efficiency and lessen demand for resources. A "Pavonistadian family" usually refers to a nuclear family consisting of a mother, father and at least one child. However, other family structures (e.g. two fathers) have a solidified presence in Pavonistade. Family structure in Pavonistade is gradually altered as a greater number of people choose alternative lifestyles, such as abstaining from marriage or taking part in cohabitation. The 2013 Census found out that 51% of people aged 18 and up were married, 37% were never married, 8.9% were widowed, and 3.1% experienced other circumstances (e.g. divorced, annulled marriage). Census recorders explain the notable amounts of unmarried people with the fact that many may wish to stay independent and individualistic, and predict that this amount would increase steadily over the 21st century. Pavonistadian indigenous culture and lifestyle leaves behind lingering impacts in contemporary culture, which harbors western influences. Pavonistadian culture is noted to be socially liberal or liberal-conservative, although there are noticeable conservative populations in Pavonistade. Contemporary Pavonistadians experience aspects from both communitarianism and individualism. Indigenous societies have been communitarian as they emphasized the harmony and relationship between the individual and the community. People became more individualist during foreign interference in Pavonistade, generating populations distinguished by how they valued individuals, communities, and their interactions. A large range of ingredients are used in Pavonistadian cuisine, markedly backed by rising multiculturalism over the past decades. Western Pavonistade is noted to be more traditional and is a source of more vegetarian cuisines than the rest of the country. The foodstuff and beverages offered outside of Western Pavonistade are said to be "modernized" or in the process of being so. Beverages that are commonly consumed across the country include coffee and chocolate beverages, the latter being used for a greater amount of time than any other in Pavonistade. Tea, carbonated soft drinks, frozen drinks, and milkshakes are also popular in more urbanized areas. Due to famines in the pre-colonization history of Pavonistade, people had turned to all available foodstuffs that could be consumed, from insects to amanita muscaria. Pavonistadians have adapted to including numerous food sources into their cuisine and do not respond negatively to exotic dishes. Virtually all consumption of organisms that would otherwise be taboo is acceptable in Pavonistadian culture. Ocelot meat is the most common and popular exotic foods, followed by cetaceans and insects. Many well-known authors and writers originate from Pavonistade. Several Pavonistadian poets are recognized in their field of poetry. A majority of famous Pavonistadian poems, especially those produced in modern times, are in open form and are not subject to rhyme schemes. Alexander Sadou and Wila Masentes are notable free verse poets, the former being prominent from 1950 to 1980 and the latter being so in contemporary times. Other poetry were written in closed form or have a rhyme scheme. Contrary to the poetry of other countries, Pavonistadian poetry more commonly utilize less-frequent rhyme schemes such as off-centered rhyme and broken rhyme. An example of a closed form poet is Oliver Hejkins, who was most active in the 1940s. Few plays, tragedies and dramatic works of Pavonistadian origins have been written although they have been received warmly among most audiences. Novels are much more significant in Pavonistade when related to other literature. There are more writers oriented with novels than with other works. Consistently-popular novel genres tend to be adventure, alternate history, horror, romance, science fiction, and young adult-oriented topics. Short stories and novellae are influential alongside novels. The largest news broadcasting corporation is the Pavonistade Agency of News (abbreviated as PAN or ANP from Pavon: Agenitidas Nowves de Pavonisteid). Unlike some broadcasting corporations, the PAN broadcasts only news reports on major events, entertainment, science, etc.. The largest broadcasting corporations include UniView Corporation and Pavonistadian Broadcasting Corporation, both known for a large range of Pavonistadian and foreign (mostly Western) programs. Production of films or series is an increasing sector of Pavonistadian entertainment, and the Pavonistadian cinema is attaining increasing attention from other countries. Most Pavonistadian production studios are based in Vadopol, along with other entertainment studios and news headquarters. Prominent organizations and studios include Centralian Pictures, CountryMotion, Lokimia Productions, PAVEntertainments, and Smasgtani Entertainment. The Internet is widely used in Pavonistade and its subculture has particularly impacted younger generations. Some of the most popular websites are of foreign origin and include Facebook, Twitter, Tumblr, Reddit and Youtube. Pavonistade participates in numerous international sports tournaments and events such as Coupe d’Esquarium. The most popular sport in the country is considered to be association football, which was designated as the national sport on 1988. Other popular sports include basketball, baseball, and tennis. Pavonistade has a national football team, which represents the country and is part of the Esquarian Football Association. The Pavonistadian Government outlawed the designation of religious events such as Christmas as federal statutory holidays, from 2000 to 2004. Despite the lifting of the ban, pre-2000 designations have not been reinstated.